PARIS, France, May 19, 1931 – A battalion of engineers, aided by an army tank and working in the light of a blazing battery of searchlights is battering away desperately tonight at 20,000 tons of rock and debris in a practically hopeless effort to save the life of Brigadier General Robert H. Dunlap, U.S. Marine Corps. General Dunlap was caught today in a landslide while making a gallant effort to rescue a daily maid in the village of Cinqmars-la-Pile, twenty miles from Tours. The dairy maid and her husband were also caught in the slide and all three were believed to be dead. There is one slight chance, if any of them managed to crawl into the far recesses of a cave milk house, which was cut into the hillside. No sound issues from the debris. General Dunlap, who had recently arrived in Paris to study strategy in the French War College, was taking a brief vacation with his wife before beginning his studies. He stopped during his morning constitutional for a chat with Denis Briant, a hired man on the farm where the general and his wife were staying. A woman’s screams interrupted their conversation. It was Brian’s wife, working in the milkhouse. Rocks from the hills above were crashing through the front wall and had already barred the milkhouse door, preventing her escape. The general rushed to her aid, closely followed by Briant. Both men were buried before they reached the woman. The prefect of the department immediately took personal charge of the rescue work, but the pitiful clawing of the villagers at the formidable mass of rock produced no result all afternoon. The real work began when engineers and a tank, ordered by the Minister of War from Tours, arrive on the scene. Mrs. Dunlap, who was still frail from a recent illness, was in collapse tonight. General Dunlap was stationed for two years in Washington, D.C. before coming to France. Prior to that he was in active service in Nicaragua. He also participated in the Boxer Uprising campaign in China. 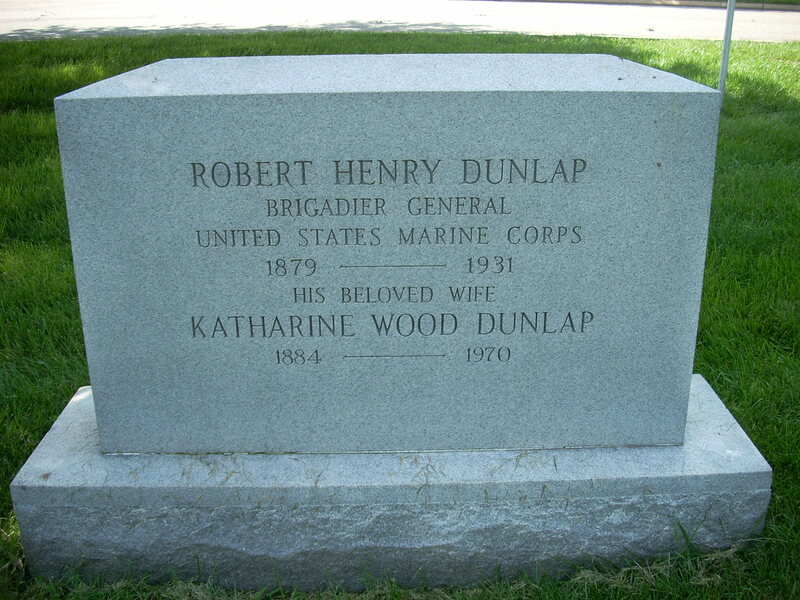 TOURS, France, May 19, 1931 – Brigadier General Robert H. Dunlap of the United States Marine Corps, was buried alive today while heroically trying to rescue a French woman, Mme. Briant, from injury below a collapsing wall at Cinq-Mars la Pile, ten miles from Tours. General Dunlap, without an instant’s hesitation, according to witnesses, dashed forward when he saw a wall, undermined by rain and tottering as the ground below it gave way, began to collapse on the woman. Her husband, who was near, rushed forward also and all three were buried beneath a great mass of crumbling earth and stone as the hillside slipped down on them. 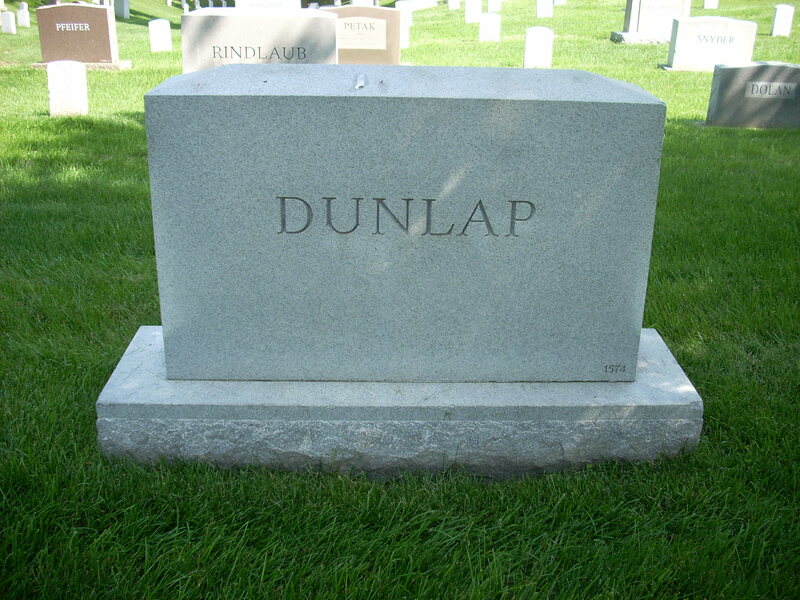 Mrs. Dunlap was a witness of her husband’s action and his probable death. General Dunlap was on detached duty here with the French Military School for instruction. With Mrs. Dunlap he was spending a short vacation at La Farinier, near Tours. As soon as news of the accident spread through the village help was rushed to the scene, but it was at once apparent that it would be a work of hours to remove the mass of stones and earth, for the accident was caused by a veritable landslide due to continual rains. A detachment of army engineers was summoned from Tours and began at once trying to locate and extricate the unfortunate victims. Tanks were brought out to help haul away the stone. Efforts were made from time to time without result to discover signs of life under the landslide. Although overcome by fright and emotion, Mrs. Dunlap immediately telephoned to the American Embassy in Paris. Ambassador Edge got in touch with the War Department and special instructions were dispatched to use every available man to try to save the General’s life if he should still be alive. The Ambassador also sent his assistant military attaché, Robert L. Walsh, to Ang-Mars. Mrs. Thom, a cousin of the General who was in Paris accompanied Lieutenant Walsh. The accident occurred at 11:30 o’clock this morning and tonight none of the bodies of the victims had been recovered. As hour after hour dragged along during the day it became more and more obvious that any hope of saving their lives must be abandoned. For a time it was considered possible that they had escaped into a nearby cellar, but when the walls were reached and knocked against, no answering sound came from within. In the course of the afternoon, too, a crevice opened in the mass of earth and stone and a courageous descent was made into it in the hope of finding at least one of the bodies there, but without any success. The place where the landslide took place is on the banks of the Loire, in the grounds of the little Chateau Fariniere. The chateau had been converted into a pension and it was there General Dunlap and his wife were staying. They were walking through the grounds when they heard one of the domestics, Mme. Briant, who was feeding cattle, cry for help. There had been a preliminary subsidence of the earth where she was working near the stable, and some stones of the stable fell on her. Her husband and General Dunlap ran to try to pull her from below the falling stones, when a second sinking occurred and all three disappeared, swallowed up in a deep crevice which opened just below the stable wall. A young girl who saw the accident declared she saw the General heap for shelter behind some rocks and that report gave rise to hope that he might he alive. The chance, however, is very small, for all afternoon the hillside has been showing new signs of cracking and sinking. New and dangerous fissures opened near where the soldiers were trying to clear the ground, and this new menace has seriously hindered the work. Several times the firemen and solders were obliged to run for safety. All that can be done is being done under the direction of army officers and local authorities. General Dunlap is one of the most distinguished officers of the Marine Corps, having fought in the Spanish War, the Boxer Rebellion, the Philippines, Central America, the West Indies and Mexico and having commanded the Seventeenth Regiment of Army Field Artillery in France during the World War. After a period of temporary duty at Marine Headquarters in Washington, General Dunlap left on February 18 for Paris to enter the Ecole de Guerre in the Fall. He had been sojourning at Cing Mars, ten miles outside Tours. He was born in Washington on December 22, 1879 and entered the Marine Corps as a Second Lieutenant for the war with Spain on August 8, 1898. The next year he received a permanent commission as a First Lieutenant and passed up through the various graded reaching that of Brigadier General on November 12, 1929. General Dunlap was attached from May 1899 to May 1902 to the Marine battalion serving in the Philippine Islands and during this period served in China from June 25, 1900 to October 9, 1900 and participated in the Battle of Tientsin. He served on the Isthmus of Panama and in 1914 participated in the occupation of Vera Cruz, Mexico. From September 1915 to February 1917 he commanded the artillery battalion serving on detached duty in Haiti and Santo Domingo and during this period participated in the engagement at Guayacanes, Dominican Republic, on July 3, 1916. On May 21, 1917 General Dunlap was detail on the staff of General Pershing for special temporary foreign short service. He returned to the United States in July of that year and in August was detailed to command the Tenth Regiment of Mobile Artillery at Quantico, Virginia. He was absent on temporary foreign shore service for duty with the planning section of the staff of the commander, United States forces operating in European waters from February 18, 1918 to October 10, 1918, on which date he was detached to command the Tenth Regiment of Marines upon its arrival in France. He was detached from this command on November 20, 1918, having been in command of the Seventeenth Regiment of Field Artillery, United States Army, from October 30, and participated in the Meuse-Argonne in command of that organization from November 1 to 11, 1918. He participated in the march to the Rhine and continued on duty with the American Expeditionary Forces until February 8, 1919, hen he returned to the United States. General Dunlap received an award of a citation certificate by General Pershing for exceptionally meritorious and conspicuous services with the Seventeenth Field Artillery and the Navy Cross for exceptionally meritorious and distinguished service as regimental commander of the Seventeenth Field Artillery during the Argonne-Meuse campaign. In 1919 and 1920, General Dunlap completed the course at the Army General Staff College and from 1922 to 1924 he commanded the Marine detachment on duty at the American Legation in Peking, China. After that duty he was assigned to command the Marine Corps Schools at Quantico, Virginia, where he remained until January 1928 when he went to Nicaragua to take command of the Eleventh Regiment of Marines and later the Second Brigade. For his service he has been recommend for the award of the Distinguished Service Medal. He returned to the United States in August 1929. General Dunlap was commended and received the Presidential Medal of Merit of Nicaragua for service in Nicaragua. He also received the Navy Distinguished Service Medal for exceptionally meritorious service as commanding officer of the Eleventh Regiment and as commanding officer of the Second Brigade in Nicaragua. On January 25, 1930 he was appointed to command of the Marine Corps base at San Diego, California. He performed this duty until December 26, 1930 when he returned to headquarters in Washington preparatory to going to France. TOURS, France, May 20, 1931 – Crouched protecting over a fear maddened woman, who life he had saved at the cost of his own, the mangled body of Brigadier General Robert H. Dunlap of the United States Marine Corps, was recovered from beneath 20 feet of boulders and debris today. Death must have been instantaneous, surgeons said. The woman, Mrs. Denis Briant, had both of her legs crushed by the landslide which crashed down from the hills yesterday, but she may live to justify the heroic efforts of the man who successfully shielded her body with his own. One of Mrs. Brian’s legs was amputated. The body of her husband, who followed the General in his vain attempt to rescue the trapped woman, was found hours later, horribly mangled. The woman’s fear crazed wail was first heard at 9 o’clock this morning. It intensified the heart breaking all-night labor of French engineering troops, who at all times went on under conditions of the greatest danger, with an ominous fissure looming above and a new landslide threatening to crash down. As the army of sappers and miners worked, two army sergeants stared fixedly at the trembling mass up above with whistles at their mouths ready to blow a signal blast at the first sign of its moving. But everyone knew that the signal must necessarily be too late. Not the least of all General Loiseau who stood well within the danger zone, directing the excavation. It was a tribute to French heroes to the dead of a foreign hero on their home soil. Their tribute got an even more dramatic expression when the broken body of the American General was gently removed from the rocks. The French officers and hundreds of toiling privates snapped to attention. The waiting peasants and villagers instinctively remembered their military training and swung their hands to their bared heads. At 1 o’clock the woman’s voice was heard more clearly begging for help. Sergeant Brisset, the outstanding hero of the rescue party, dug at the boulders with his bare and bleeding hands. A medical Captain then repeatedly with antiseptics, but they were quickly covered with blood and mud again. As a part of the General’s body and the top of the woman’s head appeared at 11 o’clock, Sergeant Brisset was compelled slowly and painfully to build a support against the boulders to protect the woman and his laboring comrades. At 11:30 the broken body of the General was placed on a stretcher and covered with a canvas. It as a full hour later before the woman could be extricated from the horrible prison. She was brought out with her eyes staring wildly, dilated and unseeing after 24 hours of black agony and stained by the blood of the man who had saved her. The body of General Dunlap will be brought to Paris tomorrow. It will be placed in the temporary mortuary chapel of the American Cathedral pending shipment to America. French military engineers, at the risk of their lives, extricated the body of Brigadier General Robert H. Dunlap of the United States Marine Corps from the debris which had crashed down on him as he tried to save the life of a woman in the village of Cinqmars-la-Pile, near Tours. General Dunlap has been studying at the French war college and was taking a vacation with Mrs. Dunlap. The endangered woman was at work in a dairy house when rocks on the hillside above were loosed. She saw her danger and screamed. General Dunlap sprang to the hillside to rescue her and was killed, but he had succeeded in bracing his body above her, and when the engineers reached the spot after hours of dangerous work that was the position in which he was found. The woman was badly hurt and almost insane with terror, but alive. When the heroic scene was uncovered the French soldiers snapped into a salute to the dead. The woman’s husband had also gone to her rescue. His body was also taken from the ruins. The woman had lost a leg and may or may not live, but her one chance of escape was under the crushed body of the American solder who went to her aid with an instinct ascendant over any claim his own life and security had on him. The French soldiers, in their turn, were exemplars of this virtue as they worked under the threatening masses poised above them, but with General Dunlap duty came as one flash and the response as another. The qualities of the soldier were automatic. Character and opportunity fused in instant action, sacrificing one life to save another. The spiritual significance of the act was its immediacy. It was spontaneous in the true sense of revealing inherent quality, military virtue as courage priceless among the nobler attributes of mankind. The French, who prize such gallantry, will have a new shrine dedicated to the faithfulness of the American soldier, and the American Marines will have pride in the name of an officer who lives in the tradition of the service. Semper Fidelis. PARIS, France, May 23, 1931 – Simple but impressive funeral services were held today in the American Cathedral for Brigadier General Robert H. Dunlap of the Untied States Marine Corps, who was killed Tuesday in a landslide near Tours while he was going to the rescue of a peasant woman. At the request of Mrs. Dunlap, the General’s widow, French military honors were omitted, but important officers of the Ministries of War and Marine and other representatives of the French Government and of all American veterans’ organizations attended. Although under the care of a physician, Mrs. Dunlap was present throughout the services. Among those present were Ambassador and Mrs. Edge, General Pershing and members of the staff of the United States Embassy. General Dunlap’s body probably will be transported home aboard the United States Liner America, sailing from Cherbourg next Thursday. A special committee has been formed by the Benjamin Franklin Post of the Veterans of Foreign Wars, which General Dunlap recently joined, to erect a monument to his memory on the spot where he met his death. Arthur M. Blake has been appointed chairman. PARIS, France, May 30, 1931 – Major Robert L. Wash telephoned the American Embassy today that Brigadier General Robert H. Dunlap, USMC, was dead and that his body that been recovered from the wreckage of yesterday’s avalanche at Tours. Major Walsh said that the body of the farmer, Denis Briant, who was struck down at the same time, also had been recovered. He said nothing further about Mme. Briant, who he reported earlier was still alive within the cave. PARIS, France, May 21, 1931 – The body of Brigadier General Robert H. Dunlap of the United States Marine Corps, who died attempting to save a French woman from a landslide, arrived this afternoon from Tours and was taken to the mortuary chapel in the American Cathedral where a guard of honor was posted. Funeral services ion Saturday morning will be simple in accordance with the widow’s wishes, but the French War Department and the American Legion have asked permission to participate. Mme. Denis Briant, who was taken alive out of the wreckage from which the body of General Dunlap was recovered, today underwent a second operation. Her condition was reported as extremely grave. Died. Brigadier General Robert Henry Dunlap, 51, of the U. S. Marine Corps, veteran of Spanish-American, Boxer Rebellion, World War battles; in a landslide at Cinq-Mars, France, as he attempted to save the life of a Mme Briand,* servant at a chateau. Hearing Mme Briand's cries in a barn cut into a chalk cliff by the River Loire, General Dunlap rushed in, followed by M. Briand. Earth and rock buried the three. Next day diggers found Mme Briand alive. 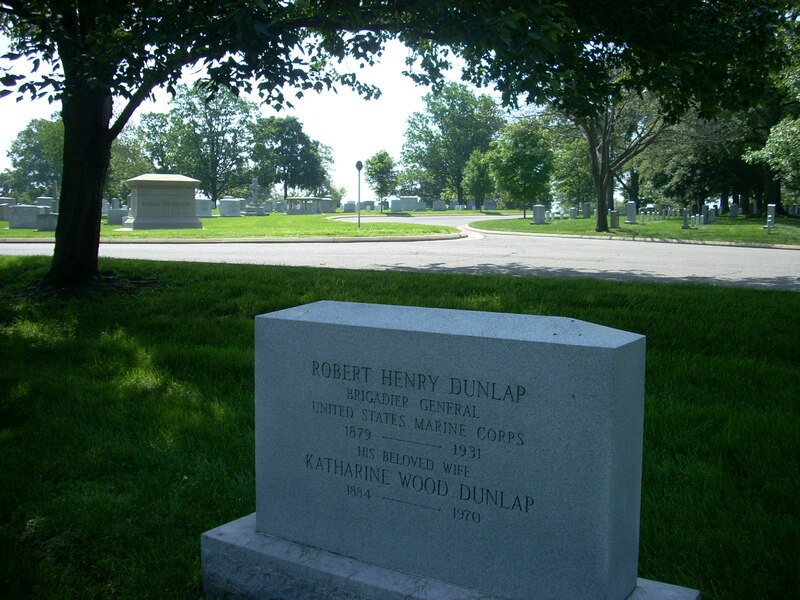 WASHINGTON, June 12, 1931 – Full military honors will be accorded the late Brigadier General Robert H. Dunlap, United States Marine Corps, killed in France on May 19 in a landslide while attempting to rescue a French woman. Services will be held at 11 o’clock tomorrow morning in Arlington National Cemetery. They will be conducted by Rev. Edwin B. Niver, USN, retired. The honorary pallbearers will be: Major General James G. Harbord, retried; Major General Ben H.Fuller, Commandant of the Marine Corps; Major General Smedley D. Butler; Major General Logan Feland; Brigadier General Rufus H. Lane; General Dion Williams, Marine Corps; Rear Admiral Frank B. Upham; Brigadier General Hugh Matthews; Brigadier General Randolph C. Berkeley; Captain Charles R. Train, aide to President Hoover; Colonel Frank E. Evans; Colonel Douglas C. McDougal; Lieutenant Colonel Charles R. Sanderson, and Lieutenant Colonel Frederick M. Wise, retired. 17th Field Artillery (Attached), 2d Division, A.E.F. The Navy Cross is presented to Robert H. Dunlap, Colonel, U.S. Marine Corps, for exceptionally meritorious and distinguished service. As Regimental Commander of the 17th Field Artillery, 2d Division, A.E.F., during the Argonne-Meuse Campaign, September to November, 1918, Colonel Dunlap displayed great ability as a leader and commander of men, and the success of his regiment was in no small measure due to his untiring energy and push, and to the offensive spirit which he displayed on many occasions. The Navy Cross is presented to Robert H. Dunlap, Brigadier General, U.S. Marine Corps, for distinguishing himself conspicuously by extraordinary courage on May 19, 1931, at La Fariniere, Cinq-Mars-la-Pile, France, where he met his death in a supreme effort to save the life of a French peasant woman.